Copyright (c) Jane Austen’s World. 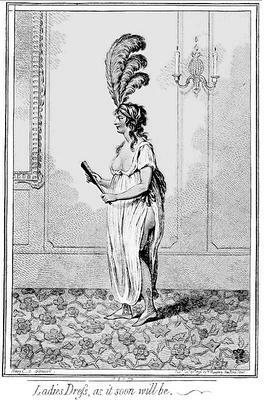 Look at this lovely Regency lady in this image from 1814. Her petticoat peeps under her fashionably short gown, whose conical shaped skirt has been given a definite shape by the undergarment. 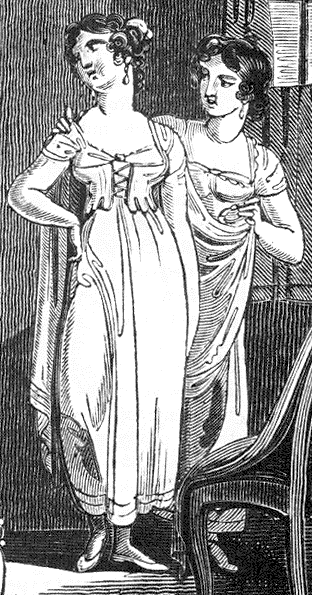 At the turn of the century, when lighter cloths were used to fashion gowns and when the dress silhouette was columnar and worn close to the body, the use of a chemise or petticoat was even more crucial, for the thin fabric would cling to the legs and work its way between them without the barrier of the petticoat. A few weeks ago, one of my posts created a stir when I revealed that drawers were regarded as optional underwear for Regency ladies, and readers wondered how a Regency lady could withstand the cold in winter. Morning Dress, Ladies Monthly Museum. While bloomers were optional, a petticoat was an absolutely necessity. Dress fabrics were gossamer thin, and petticoats, made of sturdier linen or cotton, and reinforced with tucks and perhaps a thin line of boning at the hem, served to give shape to the hem of the dress, keeping it away from the feet and body. As skirts rose, the decorative elements of a petticoat peeped out under the skirt. Below, one can see a typical petticoat of the day (with corset on top of it). This one is short, but the tucks are evident. Without this undergarment, the thin fabric of a ladies gown would hug her body, revealing her legs and her mons of Venus in stark outlines when she moved. 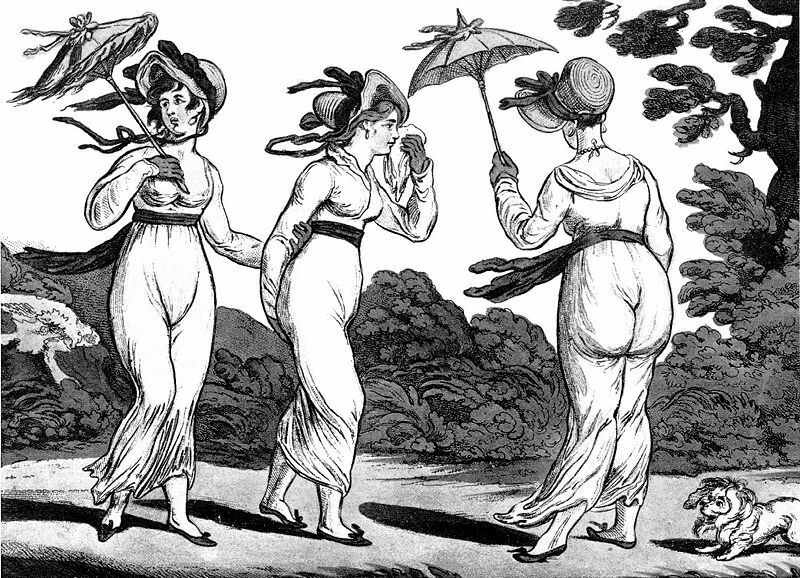 Gillray’s cartoon of The Three Graces in High Wind demonstrates how revealing Regency dresses were, even when petticoats were worn. Illustrators James Gillray, Isaac Cruickshank, and Thomas Rowlandson relished making fun of the new fashions. 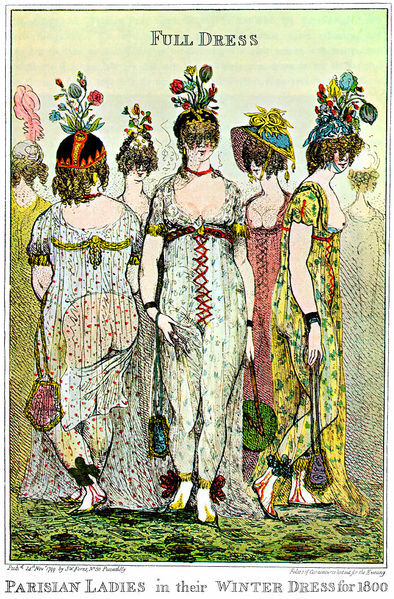 In the image below Gillray shows the effects of wearing a gown without underwear and taking the fashion features of décolleté and side slits to the extreme. Rather than creating an elegant effect, the lady resembled a tart. 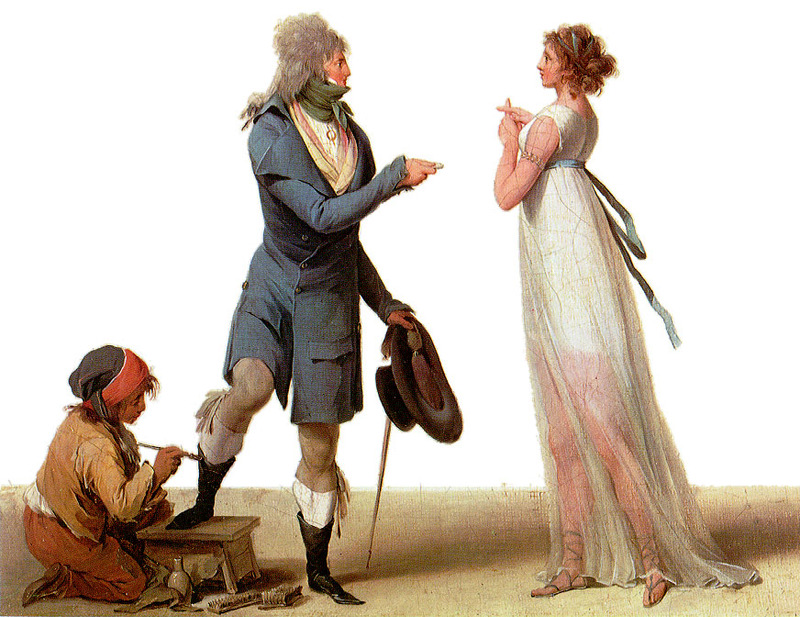 Boilly’s painting shows how clearly the chemise, which ended above the knees, shows through the thin fabric of this lady’s gown. Point de Convention, Louis-Léopold Boilly, ca. 1797. Image @ Wikimedia Commons. This image from the Kyoto Costume Institute also demonstrates the transparency of Regency gown fabrics. White muslin dress with whitework embroidery, 1810. Image Kyoto Costume Institute. The unusual (and rare) practice of dampening one’s gown at the turn of the century was most likely followed by light-o-loves, courtesans, ladybirds, cyprians, and women of ill repute. Aristocratic women who were confident in their unassailable status might have gotten away with such licentious behavior on a dare, and their fashion inclinations might have been considered “au courant”, but no proper lady, no young miss on the marriage mart, no merchant’s daughter looking to improve her station in life, would for a moment consider walking out in public without the protection of a chemise or petticoat, much less wet her gown to make it more revealing. While caricaturists showed enormous zest in depicting the new revealing fashions, they exaggerated the trend of these flimsy gowns out of all proportion in their visual commentaries. Isaak Cruikshank, Parisian ladies in full winter dress, 1800. Image @ Wikimedia Commons. Addendum: I must add that another primary purpose of these undergarments was to protect the delicate outer garment from soiling. 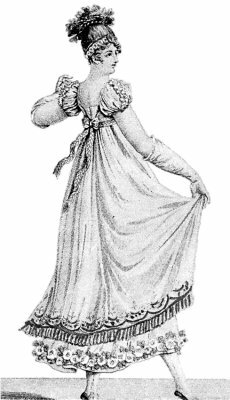 In Regency times people did not wash themselves frequently, and petticoats and chemises presented a barrier between unwashed and sweaty skin and the dress. Since undergarments were made of sturdier fabrics, they could be laundered more often. In addition, people with less means owned fewer gowns and employed fewer servants to do the laundering. Even these ladies owned a number of chemises (usually homemade) and petticoats that could be washed frequently, thereby protecting their every day AND special gowns. 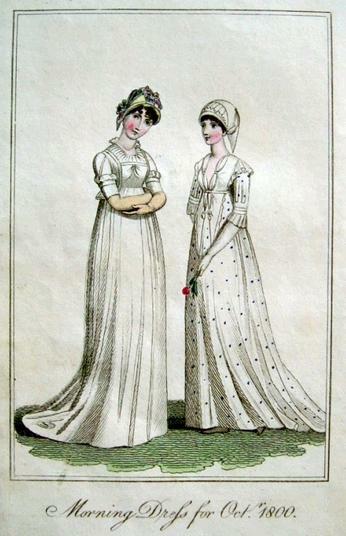 The Truth Revealed: What Do Regency Ladies Really Wear Under Those Thin Elegant Empire Dresses? No they weren’t making fun, Vic, they were enjoying every moment of the sketching process. I wonder if they had models pose for them? “What me?” would come the reply,”That’s no lady it’s your wife.” (HA!Ha!HA! Ah, but the ladies gave these artists such fodder! I believe “relish” was the proper term in this instance. Thanks for stopping by, Tony, and delving into the delicate topic of ladies’ undies. My husband and I were just discussing the fashions of 19th century women the other night, while watching a BBC movie. He noted, as I’ve often wondered to myself, how the ladies’ bustlines could plunge so low and still be considered modest. In one scene, the lady was offended because a man took her hand… shockingly, he touched her! I am discussing the bust line next. Great observation! Funny, and true, about the scanty material at the bustline, and the double standard that it presented. Even my 11 year old son (as if we don’t see enough bustlines today), asked why Elizabeth Bennet (Jennifer Ehle), was showing so much of it. HE was uncomfortable; I thought that was iteresting. I do have to say, though, cleavage showing or no, I ADORE the social customs they had. Kudos to the gentleman that could be so chivalrous and hands-off in the face of such plentiful bosoms. I loved the info. and the pics. Today it seems theres no middle section to some clothing too. smiles. Didn’t some women wear a scarf or some such item over the top of the dress or lace tucked in so it would be more modest? I know you’ll discuss that next so it’s just a question. I do love the fashions tho’. My husband calls the less decorative ones granny gowns. I have so wanted a regency dress and so I think that’s his way of saying just transfer a nightgown into one..definitely that wouldn’t work for me. I really appreciate all the hard work you put into this site…it’s really an invaluable source of information and truly amazing. Thank you. Tara Fly, Martha, and Suzan, You will love my post about Regency busts! Nothing is as simple as it seems on the surface. In those days every Morning Paper, as an essential retainer to its establishment, kept an author, who was bound to furnish daily a quantum of witty paragraphs. Sixpence a joke — and it was thought pretty high too — was Dan Stuart’s settled remuneration in these cases. The chat of the day, scandal, but, above all, dress, furnished the material. The length of no paragraph was to exceed seven lines. Shorter they might be, but they must he poignant. A fashion of flesh, or rather pink-coloured hose for the ladies, luckily coming up at the juncture, when we were on our probation for the place of Chief Jester to S.’s Paper, established our reputation in that line. We were pronounced a “capital hand.” O the conceits which we varied upon red in all its prismatic differences! from the trite and obvious flower of Cytherea, to the flaming costume of the lady that has her sitting upon “many waters.” Then there was the collateral topic of ankles. What an occasion to a truly chaste writer, like ourself, of touching that nice brink, and yet never tumbling over it, of a seemingly ever approximating something “not quite proper;” while, like a skillful posture-master, balancing betwixt decorums and their opposites, he keeps the line, from which a hair’s-breadth deviation is destruction; hovering in the confines of light and darkness, or where “both seem either;” a hazy uncertain delicacy; Autolycus-like in the Play, still putting off his expectant auditory with “Whoop, do me no harm, good man!” But, above all, that conceit arrided us most at that time, and still tickles our midriff to remember, where, allusively to the flight of Astraea — ultima Coelestum terras reliquit — we pronounced — in reverence to the stockings still — that MODESTY TAKING HER FINAL LEAVE OF MORTALS, HER LAST BLUSH WAS VISIBLE IN HER ASCENT TO THE HEAVENS BY THE TRACT OF THE GLOWING INSTEP. This might be called the crowning conceit; and was esteemed tolerable writing in those days. Oh, Six, I love this quote! Thank you. I’m just completely shocked. That gown, the real one, how could anyone wear them? Its so transparent. If it seems indecent in our world, wasn’t it far worse in the old place? It seems quite hypocritical, society back then. With those pushed up busts and talk about pure women, it doesn’t exactly seem to add up. And the cariactures make it look a million times worse. I love these posts, so interesting, =D but really, every new discovery of the Regency world makes me thankful of the 21st century. Even if there are no Darcy’s in it. Speaking of which, if those cartoons depicted a real scene in the slightest bit, then it is no wonder Mr Darcy was so turned on by Elizabeth! Stay tuned to my fashion posts, Liana. The Regency fashion situation is as complex and interesting back then as fashion is in our modern day times. Agreed, Anna. The change in fashions and mores explain Fanny Knight’s rather negative letter about her Aunts Jane and Cassandra in her old age when she was Lady Knatchbull and recalled them as being slightly vulgar. Times had changed and all Regency era customs were considered too free and loose for Victorian sensibilities. I had no idea they served such a necessary purpose! I failed to mention that often a lady would opt to wear more than one layer of petticoats. Combined with the chemise and her stays, the layers of underclothes beneath her dress would serve to warm her during winter or in drafty houses. The Three Graces in High Wind is hilarious, especially it’s very windy here in Sydney today. I’m actually imagining some of these Regency ladies battling the wind in a modern city.